Success in Business and Life. Check in to Pauline's Courses based off her Upcoming Works, "Magical Conversations" and "Gender Dynamics". Pauline is an amazingly effective coach and consultant. She conducts Group and VIP Coaching Sessions for Executives and Entrepreneurs. Don't miss another opportunity to magnetize your message for success. Get on-the-spot advice from Miss Magical Conversations, herself. Get the Magic of Miss Magical Conversations in Your Hands Now. My E-Book Courses are designed to help you transform efficiently for best results. Gender Dynamics, the science behind Miss Magical Conversations. "Pauline's Project is More than Conversations. She's Here to help." Setting intentions for collaboration and creative results, I started the idea of Magical Conversations in the UK corporate world from 2008. Since then I have hosted many Magical Conversation seminars in the UK, Europe and Asia. Over 4 years in Kuala Lumpur, Malaysia, I co-hosted regular Magical Conversation Circles (MCC) with local female colleagues Gathering together women from diverse cultures, different ages and careers proved a rich research ground to understand issues for women today. Now in the US, I have a mission to ensure men engage with each other in the same way, and then men and women join forces to converse together in new ways. For a truly magical conversation, there are simple “rules” - no one is judgmental or critical, each contributor is invited to search for common truths and mutual benefits, and to share and widen their views and experiences. Participating are invited to listen and acknowledge their challenges while being encouraged to be sensitive to diverse perspectives and be bound always by a desire for the highest good of all. The purpose of each MCC is always to nurture and elevate the collective and individual spirits around the circle. The wisdom shared is rich beyond belief and as each person returns into their daily lives, they feel very privileged to have been present and contributed. Women and men alike can share in MCC, and carefully planned and strategically focused MCCs in business produce creative improvements to team working and work cultures. Businesses flourish and become more productive when a magical conversation collaboration is established. I believe every woman has a special story and that in sharing, in a safe space, she can find that opportunity to be listened to by men. We live in a world where often women are not heard or understood. The magical conversations among women who are mindful, conscious, sharing and caring, embraced by open minded acceptance. In this way, magical outcomes may well shift our world to be harmonious and healthy for all. Men are invited and able to engage with women. Magical Conversations are possible by all participating parties. Setting intentions is vital. My passion is for women to ‘step up and speak out’ today. It is also critical that men are listened to and allowed to share emotions appropriately. Opening our hearts and voices to our collective truth is vital now more than ever before. 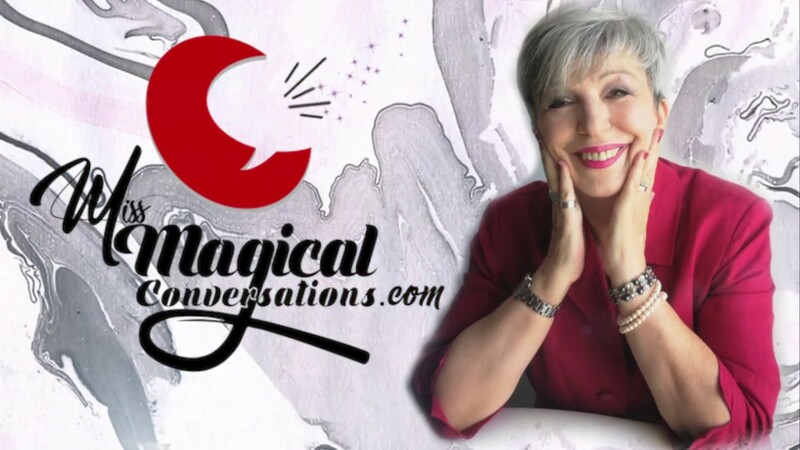 Becoming aware of the natural positive influence each person has in conversation making, Pauline recognizes and outlines the core values that guide what she names as Magical Conversations. It is especially critical today when men and women are conversing to understand the range of people round every table, be it the boardroom or the bedroom. Now more than ever Magical Conversations become a top priority when addressing the issues that surround men and women on how to share their wisdom with each other. As Miss Magical Conversations, and leading expert in Gender Dynamics© – I've created a new map for women and men to understand each other. When your value your differences and similarities, I do believe you each are a part of a magical force that has never been in the work environment before; a dynamic mix that co-creates a new business culture which reverberates through your relationships and society, at large.By combining new awareness of yourselves and of your world, together we can use Magical Communication to evolve our world and reinvigorate the workforce for efficiency and sustainability.